The Spanish really know how to party. With countless numbers of resorts dotting the nation, millions head to Spain every year to soak up the sun, sample the food and have fun all night long. The Spanish tradition of nightlife starts with tapas, a meal or a cultural event, before heading to a bar and finally a club. The night is often rounded off by a breakfast at around 7am before heading off to bed. A very full night indeed. The Balearic Islands, which sit off the east coast of Spain in the Mediterranean Sea, are a group of small islands with a reputation as the biggest party destinations in the world. The island of Ibiza is the most famous of these, a legendary mecca for clubbers, sun-seekers and party animals alike. The climate of the Balearics is very similar to the east coast of Spain – during the summer the sun is blazing, and the island’s pristine white beaches are an ideal place to sunbathe the days away. But the real Ibiza experience only starts as the sun sets and the island’s incredible club scene opens up for the evening. 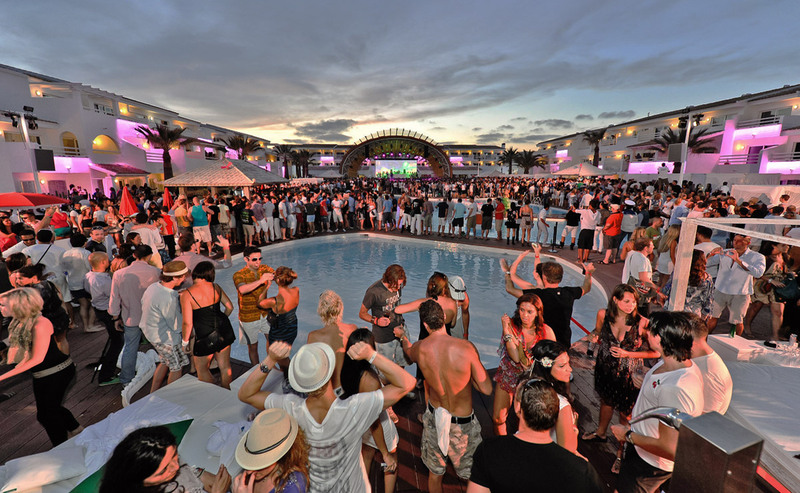 Clubs such as Pacha, Eden and Amnesia blast dance music until the very small hours and often feature residencies from European and American DJs such as Deadmau5, Zane Lowe and Pete Tong. For music lovers who want a break from techno, trance and Balearic house, Ibiza Rocks hosts live music gigs by British and American bands. Upcoming shows include The Vaccines, Rizzle Kicks and Ellie Goulding. Another Balearic Island with a great reputation for partying is Mallorca (Also known as Majorca, not to be confused with Minorca) the archipelago’s capital. Magaluf is particularly popular with party-goers, and the resort is almost entirely geared towards after-dark fun. The strip is crammed with bars and small clubs, all boasting drinks promotions and free cocktails to entice in more and more customers. The BCM plaza includes the BCM superclub, the biggest venue in Magaluf that sometimes features residencies from British DJs. The drinks prices here are generally cheaper than they are on the strip, but prices everywhere are generally reasonable. The music played in the clubs and bars in Mallorca is not as cool or diverse as it is in Ibiza, but you’ll be having so much fun you’ll hardly care. Located on the southern coast of Spain, the city of Marbella is part of the famed Costa del Sol (Sunshine coast) and boasts one the warmest climates on the Spanish mainland. Marbella’s coastline stretches out for 27km and the breaches are pristine and golden-white. Many of the city’s classier bars are located in Puerto Banus, a seaside marina which is a favourite of the region’s rich and famous. Tibu Banus is open all night until 7am in the summer and serves as a bar, restaurant and club. La Sala is another glamorous bar, club and restaurant that also features live music and DJs throughout the day. A great place to spend an evening. ‘Nightlife’ may not be the first thing that springs to mind when you plan to pay Barcelona a visit, but there’s a lot more to Spain’s second city than beautiful architecture. Bar crawls are a common sight in the city’s central streets, and whether you’re from England, Ireland or Mexico you’re bound to find a regional bar somewhere for if you’re feeling a little homesick. One of the city’s great nightlife treasures is Espit Chupitos in the Barri Gótic area. Chupitos is Spanish for shots, and that’s all they sell. Two hundred of them. With expert bartenders ready to cook up some of the most elaborate and delicious shots you’ve ever tasted, just walk up to the bar and ask for a recommendation. Whether you want something sweet, sour, strong or on fire, there’ll be something on the menu for you. Spain’s capital city Madrid has a worldwide reputation as a city of partygoers. Unlike the other nightlife destinations on this list, Madrid is nowhere near the coast, and although it is quite warm during the summer, it is a lot more temperate than some of the more sundrenched areas like the Costa del Sol and the Balearic Islands. But Madrid more than makes up for this due to the sheer variety of nightlife on offer there. Tapas bars are popular, with areas such as La Latina and Puerta Del Sol which are crammed with small but perfectly formed bars big with locals and visitors alike. The idea of tapas is to order one drink and one small dish of food, then move on to another bar and repeat. Later on, the real nightlife begins, but Spaniards are known to party much later than you might be used to. Bars may well be dead until ten, and clubs won’t really get started until after midnight. But when they do finally get going, the people of Madrid know how to party with the best of them. Located on the west coast of Spain, often known as the Costa Blanca (White Coast), Benidorm was once a small fishing village. The region’s pristine beaches, crystal clear waters and warm climate attracted the tourist industry to the village and the area exploded with hotels, shops, resorts and huge skyscrapers – the town has more skyscrapers per person than anywhere else in the world. Very popular with British tourists and ex-pats, you’re not going to get much opportunity to practice your Spanish here, but the variety of entertainment and nightlife here still has a Mediterranean vibe to it. A unique feature of the Benidorm resorts is their cabaret and musical theatre shows at venues such as the Benidorm Palace, the Stardust Club and Levi’s Showboat. This entertainment often starts in the afternoon but some are shown later at night or even into the early morning. Whatever your idea of a good night out is, Spain will have a resort for you. From the hip sounds of Ibiza, to the local charm of Madrid and the gaudy fun of Magaluf, joining the millions of revellers that flock to the country every year will leave you with a holiday experience that you will never forget. If you actually remember it the morning after, that is.